Our new Moda bike has been very well received. It has good storage space under the seat however it seemed to me that it was unfortunately just the wrong shape to take a helmet and mine did not fit. Not having to carry a helmet around while your bike is parked can be very valuable and one of our customers has now sourced a helmet which will fit and you can see it on this link. Thanks to James who ordered the medium size. Incidentally the back box on the City bike will accommodate a slightly bigger helmet. I was hoping to get the top box on my moda in the future (there is the back rest there that was not on original photos that i hope to swap). i saw some white one to match the color. Love my new Moda for nipping around town and past the traffic queues! Its quite hilly around here and I do need to ensure the battery is well charged for best performance but it copes well. 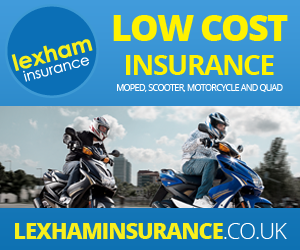 The insurance through Lexham is much more than expected even with just fire and theft as they would not accept a car NCD and I didn’t have a bike NCD. I did have to get a helmet with soft folding sides so that it would fit under the saddle. My other helmet doesn’t have a fixed jaw either so cant really secure it with a bike cable. I’ve never fitted the back box to either of my Model 30’s Ken, I simply carry a cable type bicycle lock under the seat and if I’m leaving the bike anywhere I just sit the helmet on the rear rack and then thread the lock through the jaw guard and the rack, it sits happily on there and with the visor pulled down it is showerproof should it start to rain while I’m away. Luckily we have very little crime over here and the lock serves more to stop my helmet falling off onto the floor in a gust of wind or if the bike gets knocked, but it is a fairly secure way of leaving the helmet, worse case scenario the only thing light fingers could still do is pinch the visor, but at least you would still have a helmet to ride home with, unless they are determined enough to start cutting locks off, in which case they’ll prise the seat up just as easily.